The wind hitting me in the face felt as if I had just opened my oven door. My t-shirt stuck to my back and I could feel sweat trickle down my forehead. The desert crossing in between the Silk Road cities were some of the hardest we did on this trip. As I leant back in my seat on the yellow truck, I tried to imagine crossing this part of the world with camels in tow. Yet, despite the heat and the loneliness of the desert, visiting the Silk Road cities was one of the most rewarding parts of my trip. 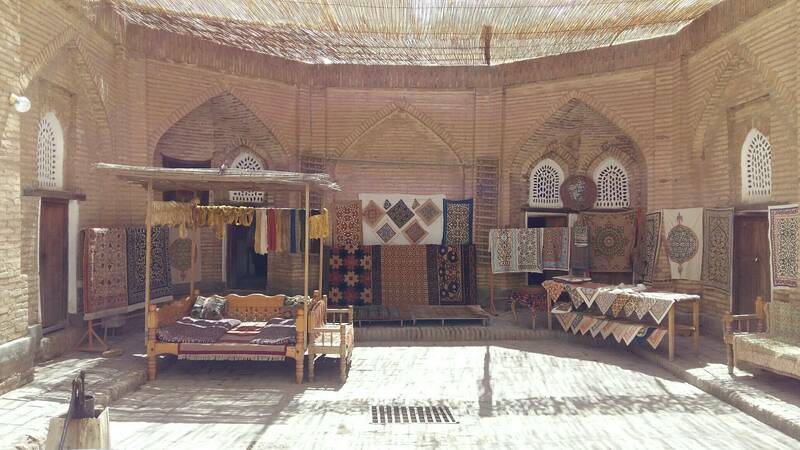 We went to three of them, Khiva, Bukhara and Samarkand, and I know there are more that are worth seeing, but I recommend that you check out at least those three. 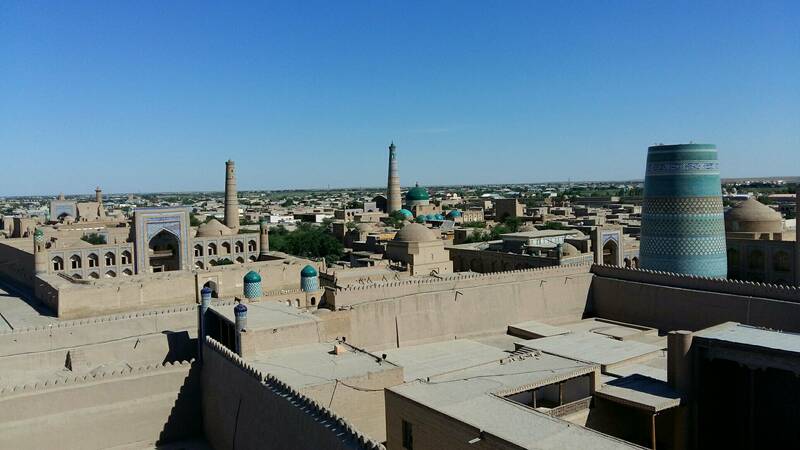 Our first stop on the Silk Road was the lovely city of Khiva. As all the cities mentioned above, it played an important role in the Middle Ages. The city is small enough to explore on foot. A huge wall surrounds the centre and we were lucky to stay there in a B&B. You are allowed to walk around on your own, but to visit any of the museums, you need to buy a ticket at the west gate. We got ours the evening when we arrived. It is valid for two days and includes entry to all sites except for a watchtower, a minaret and a stunning mausoleum (that is well worth paying for). After getting the tickets, we took a walk. The sun still stood high in the sky and sweat trickled down my back as we crossed the plaza in front of the Ark. It had once been a bustling bazaar, now we were the only people here. We quickly found the main entrance and slipped through the giant wooden door, taking only a small moment to enjoy the intricate carvings. The shade offered a short break from the heat before we found ourselves in the main courtyard. The Ark had been a palace back in the times, in a country of nomadic people, so it wasn’t a surprise to see a round pedestal on which the rules had once set up their yurt. But the biggest surprise waited for us around the corner. 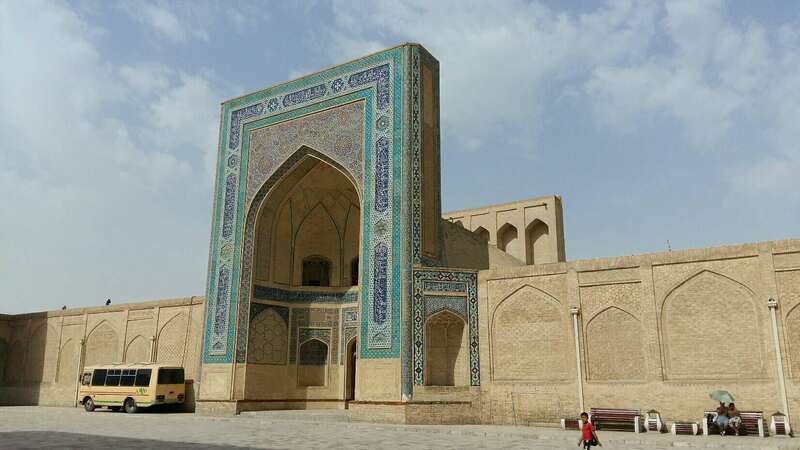 We turned and stopped, mouth open as we stared at the blue tiles that covered the walls of the open-air summer mosque. The Ark is also the place where you find the watchtower and it is worth paying the 6.000 Som to climb to the top and get an overview of the city. The best about all of this? The Ark is only one of the 17 attractions included in your tickets. Other highlights include stunning medressas that are these days filled with museums that have exhibits of varying quality. The museum of applied arts is well worth a visit. If you’re looking for a laugh, stop by the nature museum. They have amazing exhibits of a potato, a couple of melted tomatoes and, of course, the ugly sheep. I’ll leave it up to you to discover what that is. Sitting next to a pool underneath a mulberry tree, I could hardly believe that these water pools, where people had gathered in the middle ages to wash and drink (and possibly pee) had once helped spread the plague around the city, killing thousands and thousands of people. These days, Lyabi-Hauz couldn’t be more peaceful. 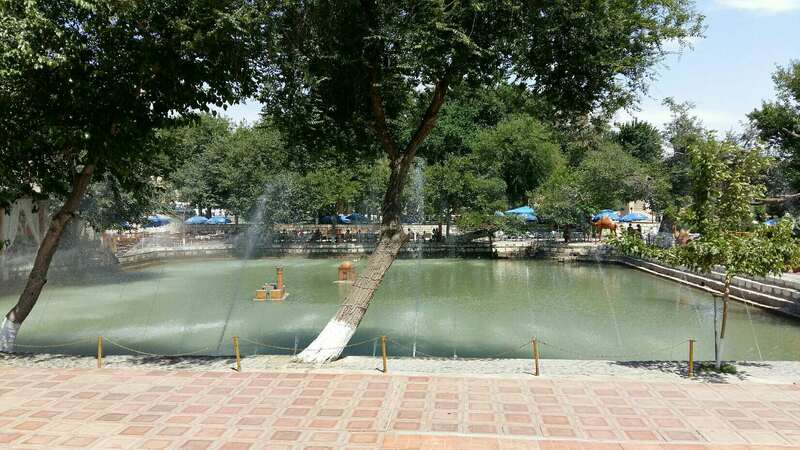 It is the local gathering place both during the day, when people will enjoy eating ice cream while sitting in the shade, as well as in the evening, when street vendors set up their carts and small children drive around in tiny, remote-controlled cars. 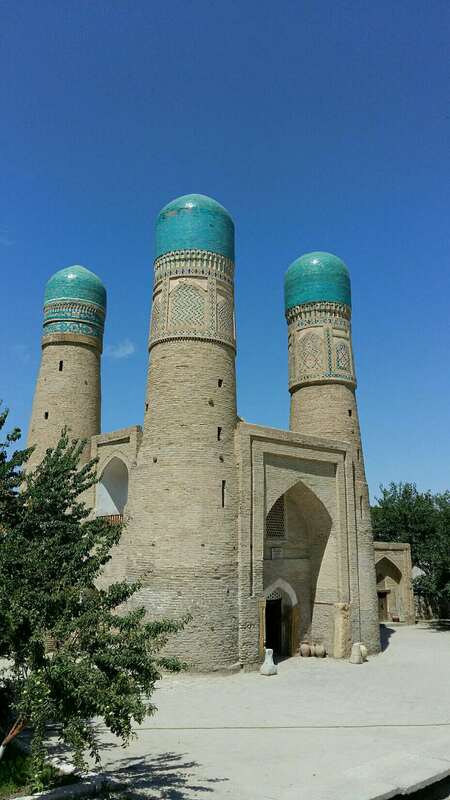 Bukhara is also the city of mosques, minarets and medressas and in no other city will you get a chance to visit as many of them. If you have enough time, visit the Jewish graveyard. It is located south of the Old Town. The local tradition seems to be to engrave pictures of the deceased on the gravestone, so you get an idea of who the person was. It was a very interesting experience, walking around the place. My second recommendation would be to get a guide at the Ark. It will help you put everything you see into a context so you understand what you are looking at. Otherwise, you might feel like watching a movie on mute without subtitles. 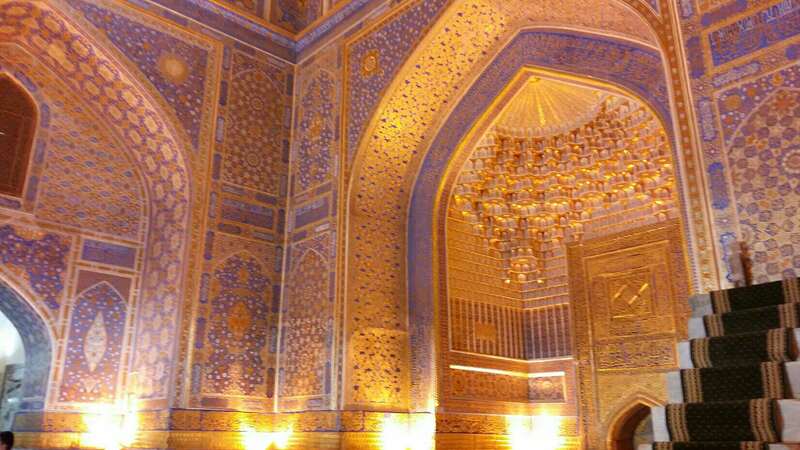 Samarkand, the Silk Road city that everyone has heard of. 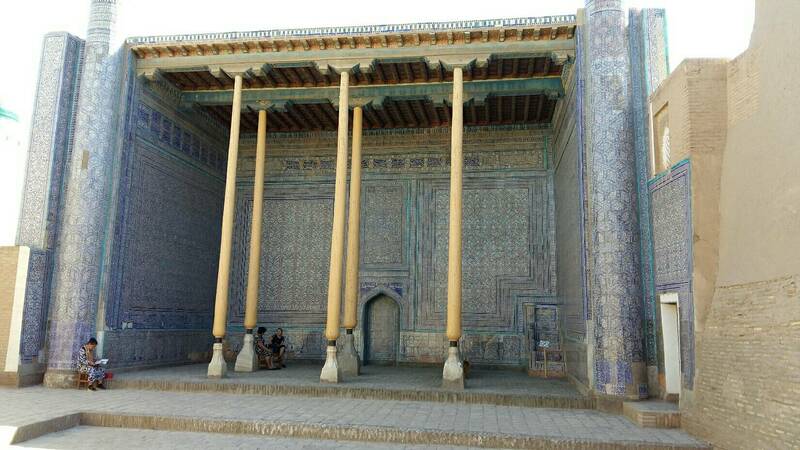 No other place evoques that feeling of bazaars, caravans squeezing through narrow alleys and medressas with the world’s best scholars as much as Samarkand. 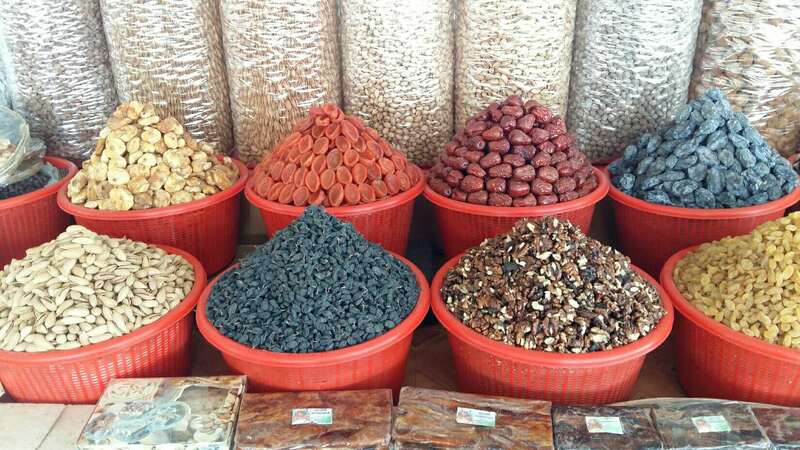 While people keep arguing whether or not it is the prettiest of the Silk Road cities, it is, without doubt, a place where you can enjoy staying at least two or three days. The Registan is a must, even if you only have a couple of hours in the city. The complex, which is made up of three medressas, is stunning to see from the outside. The inside is mainly made up of souvenir shops, but there is a beautiful golden mosque in one of them that you shouldn’t miss. The next thing you have to see is the Shah-i-Zinda. It is an avenue of mausoleums, one more stunning than the next one. The tilework is some of the most beautiful you can see in Central Asia. We spent at least an hour or two walking from one mausoleum to another. Make sure to read the rules and don’t forget that you’re not allowed to sacrifice animals on the graves! Besides those two attractions, one that I found to be very good is Ulugbek’s observatory. There isn’t much left of the observatory but the museum was very good. Do you know anything about Ulugbek, one of the greatest scientists of the Middle Ages? I didn’t, so this was worth it. And while we’re at it, if you have time left, take a taxi to Timur’s mausoleum from the observatory. You will have learned enough in the museum to fully appreciate its significance. Don’t like any of the above options? Head to the bazaar instead and stock up on whatever you need. Of course, there is much more to do but I hope this gives you an overview of the Silk Road cities. You definitely should go! 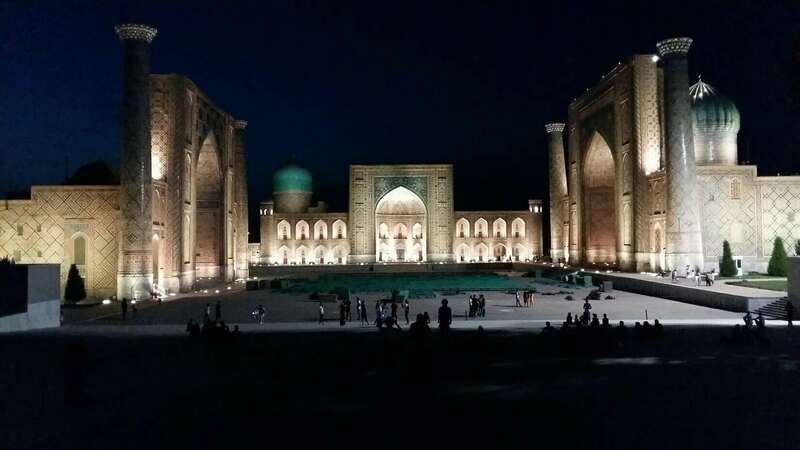 Uzbekistan is a beautiful country. It’s quite cheap, too, and easy to get around between cities. Plus, the people are very friendly. Very interesting if you don’t mind , where did you start and how many visas you get? I started in Turkmenistan, in Ashgabat. The Turkmenistan visa is quite hard to get, you will need to get a Letter of Invitation, which you can only obtain through a tour agency. I also needed a visa for Usbekistan, which for me, being German, was quite straight forward to get. Kazakhstan gave me a visa at the border, as well as Kyrgyzstan.